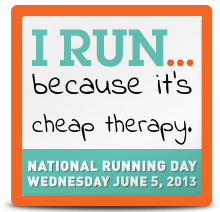 It’s National Running Day! I know. Like I need a “day” to motivate me to run, right? I run because it’s good exercise. I run because it’s easy for me. I run because it’s fun. I run because my friends and I can socialize during that time. I run to challenge myself. Will you get out and run today? I’m going to try to get out for 2-3 miles. Keeping it easy this week! You know I’ll be running! Whoohoo! You and that double running. Ouch. Today is National Running Day. I actually think any day can be running day, but I like that there’s kind of a holiday for running. I was exhausted, but I told Brooke that I had planned on running, and rather than back out of it, I headed out at almost 8 p.m. for two miles. I run because it’s somewhat easy for me, as far as exercise goes. Walking is even easier, but running gives me more of a sense of accomplishment. In high school, I ran indoor and outdoor track. I still stuck with the middle distances. At one meet, I remember we needed people for the two-mile run. We needed anyone who could do the event, just to get points for the team. I volunteered, and then I goofed off during the run. I finished in a decent place (but not before talking to my friends and teammates and jogging the two miles) and my coach made that my event from that meet on. My junior and senior years found me on the cross country team. I went on to run cross country in college. Crazy, right? I still never considered myself fast. I was usually one of the slower girls on the team, but I could be depended on to run hard, and sometimes score points for my team in races. Cross country (and track) teams win meets on a point system – cross country essentially counts points for the top five runners of a team. If there’s a time, they go to the sixth runner of the tied teams and whoever had the “faster” sixth runner won the meet. I was often that sixth runner in college. Somebody has to be sixth, right? Sadly, I didn’t run cross country my senior year of college. I got a boyfriend, bought a car, got a job, and I worked on Saturdays. A year after I graduated, I found myself at a sad weight, and finally changed my eating and exercising habits. I started running again. And I haven’t looked back. 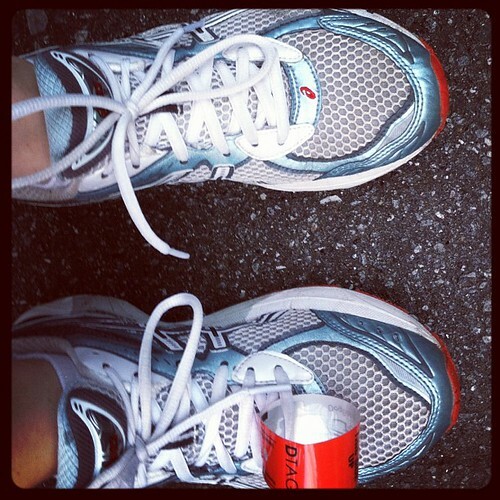 I run now because of convenience and the runner’s high I get. Even if I run “just” two miles, I feel great. I’ve run four marathons and many more half marathons – and more 5ks than I can think of right now. I love it. Do you run? What motivates you? I loved this post! Great job getting a run in today!